There are so many data cheats to use on airtel and if you are missing anyone of them now, sorry for you. These airtel data cheats have been tested and proven to work so there is nothing to worry about. You know expensive data can be nowadays and we all feel the need to check what is going on in facebook, read new tweets by our favorite celebs or stalk that beautiful girl we see on instagram. Some of us also need to keep our blog and online businesses rolling so we tend to find the most economizing data cheats to do that. Which brings us to this page. There so many airtel data cheats you have used in the past. Some worked while some did not. Some even stopped working after some time but you are in luck today because we just found some of the greatest airtel data cheats to use daily. This airtel data is actually legal but it is called a cheat because you get to use your money past the normal rate. Imagine getting 2GB for just N100. Isn’t that cool enough? You don’t need to have a specific kind of phone before you use this data plan. It works perfectly on all devices including androids and iOS. The full steps to carry out this simple but sweet data trick is right here for you. Get your pen and paper ready. There are some requirements before you start this cheat though. it has been tested and trusted by other people and that is why you are being showed right here on trickvile. Don’t worry, it is completely harmless. first, you must port from MTN to airtel before you can activate it. All you need to do is find an old MTN sim you do not need anymore and port. If you do not know how to port, continue reading below. Valid means of identification (either national id card, drivers license or permanent voters card). If above requirements are met, then follow the next steps below. You will be given a form to fill. Follow every instruction you are given. After that, a text message will be sent to you from airtel. After few seconds, you won’t see the MTN network on your phone again. Switch it off and switch it back on. You will be asked to insert your new airtel sim which you just ported to. Switch off your phone and insert your new ported Airtel line. A notification will be sent from airtel that you have been ported and now we can now head on to the cheat. Now that you have ported, follow the remaining part of this post with full attention because it may not work if you miss a step. To get the cheat, you need to recharge your phone from your bank account or zoto wallet. The reason why you are doing this is so that you will have an exact amount of N100 on your phone and it won’t exceed. If there is an addition of 1 kobo, it won’t work. 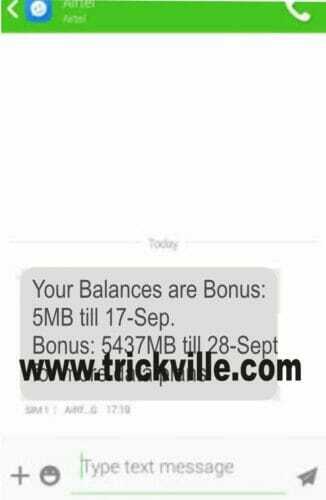 Just follow the steps below to get your airtel bonus. After that, you will receive a message that you have been given 2GB of data free. Now dial *223# to check your MB/Data balance. Data is valid for 30 days (1 Month). To get 10GB for N500, follow the steps below. Since N100 gives you 2GB, N500 will give you 10GB. That is the basic simple free airtel data cheat. It works like magic.